Canada is well suited for growing a wide range of pulse crops. In Saskatchewan we produce peas, lentils, chickpeas, beans, soybeans, and faba beans. On March 29, 2019, the Government of India issued a notification revising the existing quantitative restrictions applying to the import of peas into India. Join Dr. Barb Ziesman, Provincial Specialist, Plant Disease with the Saskatchewan Ministry of Agriculture as she covers the full range of integrated pest management options available for pulse disease. 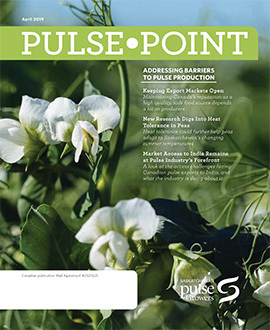 April's edition focuses on how growers can keep export markets open, new research that is looking at breeding heat tolerance into pea varieties, and the continued work the pulse industry is doing on market access to India. As the Saskatchewan pulse industry has grown, we have seen advancements in pulse crop production. As larger crops come off the field, more Canadian pulses are being exported each year. This is why maintaining and expanding access to key export markets, while also being viewed as a reliable supplier for pulses around the world, is critical.